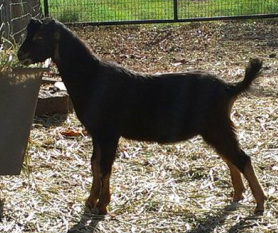 We have long admired the Lamanchas at Dream-Fire Farm and feel privileged that Lynne Fancher has shared Kira with us. She is an Xavier x Delight daughter, clearly a great combination ! She freshened for the first time in Feb 2009 with a gorgeous udder. In her 11 month of lactation, she was Res Grand x2 at the 2010 Fort Worth Stock Show (behind Sonara!) and was Best Lamancha Udder the first day ! 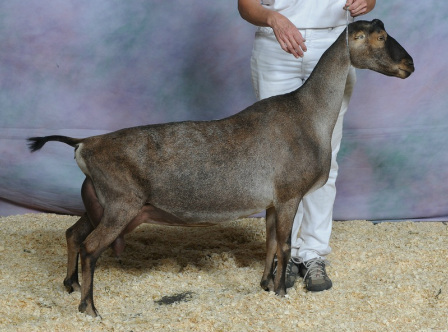 Her doeling from 2009 (Xena) was 6th place in her senior yearling class at the 2011 ADGA nationals, our very first trip to nationals. She was AI'd to Mint*Leaf American Idol (son of Preference Flyer) & blessed us with a single gorgeous buckling in 2010, Latte Da Captain America ("The Captain") who is contributing to our herd ! 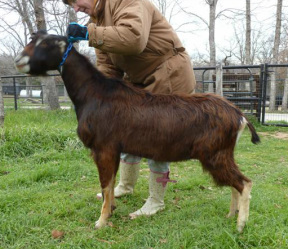 In 2012 we got another buckling from breeding her to Black Star (grandson) and now have Latte Da Cooper in our all-star buck lineup. Her udder keeps getting better and better and she clearly is earning her keep in the milk department ! She milked over 2700 pounds in 2011 and will surpass that in 2012. Kira finished her PERMANENT CH in 2012.